Old City District unveiled the results of its Vision 2026 plan Wednesday night, which aims to provide a blueprint for urban growth in Philadelphia’s historic center, and the easternmost section of Market Street. Over the past several months, OCD, The RBA Group, Atkin Olshin Schade Architects, and Urban Partners have been studying the area, and surveying residents, businesses, and visitors in an attempt to translate the neighborhood’s values and priorities into actionable projects and policy changes. One theme running through the plan is the idea that Old City can become a better place for all of these groups by focusing on quality of life improvements for the locals. A shared street (also known a ‘woonerf’) is an increasingly popular concept from the complete streets toolkit that hasn’t yet made its way to Philly, but essentially it’s a curbless street where pedestrians and vehicles occupy the same plane. They are common in cities in the Netherlands, Copenhagen, and Germany. In Pennsylvania, Pittsburgh turned Market Square into a shared space a few years ago, and the Peduto administration is looking to transform the Golden Triangle as well. Conventional street design strives for separation of the pedestrian and vehicle zones to encourage the free flow of vehicles, while shared space designs de-prioritize vehicles in favor of a free flow of pedestrian foot traffic, using subtler materials like bollards or pavement patterns to define the space. Motorists tend to drive more slowly and cautiously in mixed traffic with pedestrians and cyclists. OCD Executive Director Job Itzkowitz cautioned that this is just one possible concept. Any real-world changes would require a great deal of planning, design, and outreach to property owners, but he wanted to start a conversation about rethinking the vast amount of space on Market Street on the east side. “The past isn't always prologue, but if we take the same trends that have been occurring within the past 15 years and project them into the next 15, the vehicular demand on Market Street won't be the same as it even is today,” Maciunas says. Vehicle traffic has fallen 35 percent since 1999, according to figures from DVRPC, while the 2nd Street El station saw a nearly 30-percent increase in boardings during that period. In the Vision 2026 survey, respondents were concerned about the impact of more vehicle traffic on quality of life in the neighborhood as it grows, and this was one of several ways planners set out to address that concern. Other recommendations include better marketing and shorter off-peak headways for the Route 57 bus, installing more bike-share stations and bike parking, and various curb parking and loading zone reforms. One of the plan’s goals is to focus attention on places that feel like barriers in the neighborhood, like Market Street and the Benjamin Franklin Bridge. The area underneath the Bridge is vast and seems full of potential for a public gathering space of some kind, but has been unused to date. It is controlled by the Delaware River Port Authority. In addition to the security and liability issues to be ironed out, it’s also not entirely clear whether the area is cut out for being a public gathering space. The space under the Bridge between 2nd and 4th streets can hold up to 150 parking spaces. One of the findings from the survey was that respondents rated nearby parks on the edge of the neighborhood highly, like Franklin Square and Washington Square, but weren’t as thrilled with the smaller parks within the neighborhood. The Vision2026 plan aims to change this. 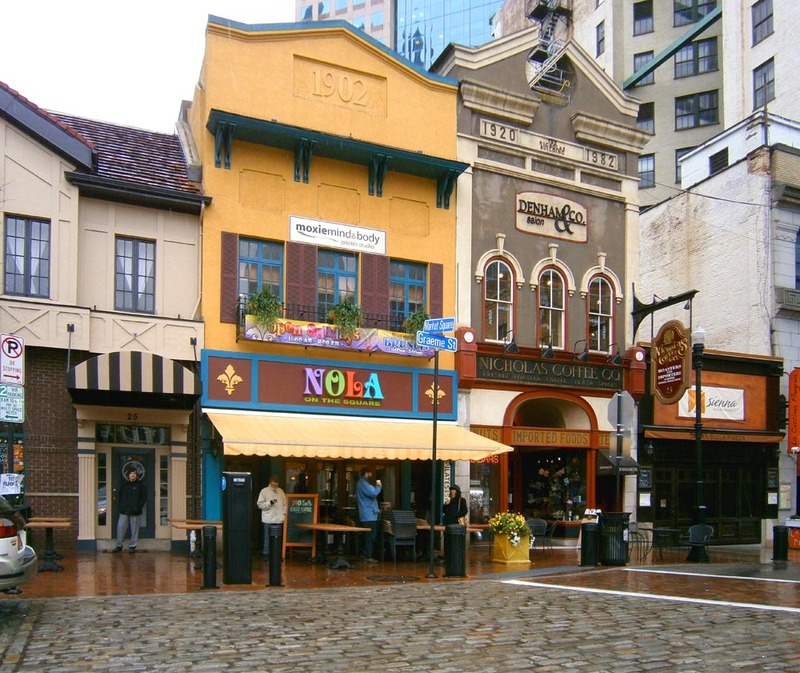 “With the right physical and programmatic interventions, Old City is poised to boast a patchwork of small-scale public spaces that enrich daily life of the neighborhood, and make it an even more wonderful place to visit,” the report says. The square at the corner of Market, 2nd, and Church streets typically referred to as Christ Church Park was identified as the best candidate for a makeover, due to its location on a busy corner near the center of the neighborhood. The space is about the same size as Fitler Square, and is currently a blank green patch that is used mainly by residents walking their dogs. There are benches to sit on along the side, but venturing into the center of the lawn without a dog feels awkward. Some of the recommendations for improving the space include locating new park entrances midway along the sides on Market and 2nd Street, rather than at the corners, and better defining the space with walking paths, landscaping, additional seating, and programming. Other areas identified as good candidates for a rethink include the lot next to Elfreth’s Alley, Monument Plaza and the link to Franklin Square, and Welcome Park near the Ritz movie theater. The plan is intended as a framework that will set the stage for further research, and OCD will continue to solicit public feedback. Read the full report and send any feedback to info@oldcitydistrict.org.